Cream of Mushroom Soup. So much better than that canned stuff you had as a kid. Celery, Corn, and Bacon Chowder. Celery takes the lead role in this hearty dish. Vegan Mulligatawny Soup with Cabbage. Chickpeas add depth to this spicy Indian-style soup. Pasta e Fagioli Soup. This pasta and bean soup is Italian comfort food. Tuscan Bean and Pasta Soup. Vegan Italian. Yum. White Bean and Potato Soup. Make this with ham bone (or a handy substitute). Split Pea Soup with Bacon. Ham-bone flavor without the ham bone. Leek and Potato Soup. This classic is great as a first course, but sturdy enough for a main. Spicy Roast Winter Squash Soup. Healthy flavor for hearty appetites. Check out the index for additional soup ideas. Cabbage Chili with Spicy Sausage. Black-eyed peas add savor to this healthy cold-weather pleaser. Meat and Potatoes Chili. Because meat. And potatoes. Texas-Style Chili con Carne. Warm up with a meat-centric classic. Made the traditional way (without beans). Sweet Potato Chili with Black Beans. Sweet potatoes make this veggie chili a contender. Pumpkin and Pork Chili. It’s autumn, so pumpkins. Right? Pulled Pork Green Chile Chili. Flavorful, but mild enough for the spice-shy. 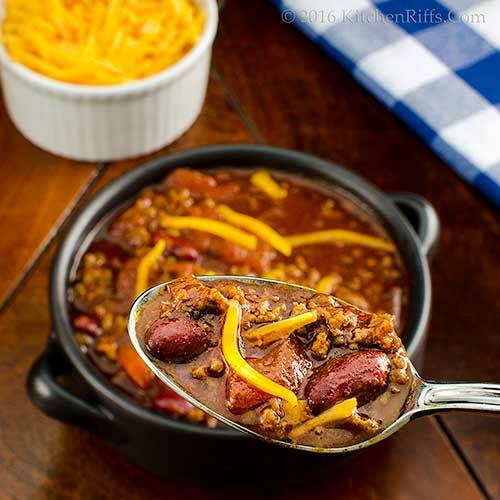 BBQ Beef Brisket Chili. Beer and barbecue sauce are ingredients. Need we say more? Check out the index for additional chili ideas. We’re taking some down time for the next few weeks. So we won’t be posting (or visiting other blogs) for a while. We’ll be back on October 11th with a new recipe. See you then! Hi Amy, soup and chili season is the best, isn't it? At least it's my favorite cooking season. :-) Thanks for the comment. Great ideas for fall which has arrived all too soon! I love savory-flavored pumpkin dishes. My idea of pumpkin spice is sage & onions. I can't wait to slurp my way through each and every one of these, John, great collection, and I'm going to start with that divine mushroom soup! Hi Mae, sage and onions sounds like a terrific pumpkin spice! Good flavor combo. :-) Thanks for the comment. Hi Sue, that mushroom soup is really good! Enjoy. :-) Thanks for the comment. All of them look so comforting and delish that would be hard to choose only one to cook. Hi Denise, guess you'll have to cook them all. :D Thanks for the comment. oh wow! This chili screams fall. Just beautiful. Hi Velva, don't you love a big bowl of chili in the fall? Or winter? Love the stuff. :-) Thanks for the comment. I am so not ready for fall, but I always love a good soup. Enjoy your break! Oh wow such a fantastic array of soups. I'm just sitting outside right now enjoying our fall-like weather and looking at how many trees are starting to change color. This is my favorite time of the year and enjoy indulging in soups. Thanks for sharing this nice assortment. Enjoy your time off. See you in October. Hi Laura, it's always soup time around here. :-) Thanks for the comment. NO...No...we still have one more week of summer!!! :) How I hate to see summer leave; however, I do love the fall and I do love soup season. This is a great list of fall soups. The Cream of Mushroom Soup has my name on it. Thanks John! Have a wonderful vacation! 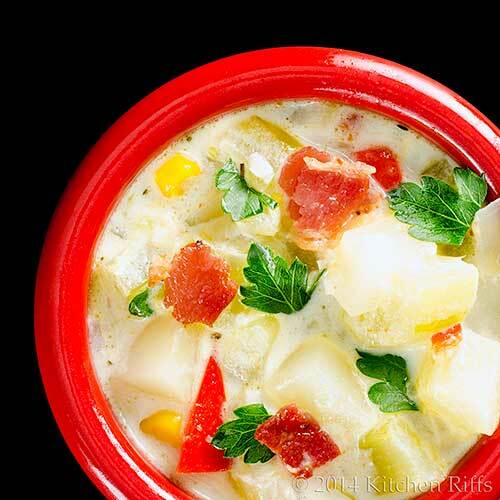 Your celery, corn, and bacon chowder looks scrumptious right now. Perfect timing for the chillier nights, I've been craving soup ever since they turned the fall switch on! I love the heartier soups and chilis too, real comfort food. Cream of mushroom soup sounds so wonderful right now, and as luck would have it, I have an assortment of mushrooms in my fridge. Such a beautiful and delicious collection of Fall recipes. Pumpkin season is just awesome. Fall is my favorite time of year and YAY for soup season. Great line up! Bring it on. Hi Vicki, love this time of the year! Not only is the weather changing, but the quality of light is changing, too. Thanks for the comment. Hi MJ, that cream of mushroom soup is special. :-) Thanks for the comment. Hi Nami, that's good stuff! :-) Thanks for the comment. Hi Eva, that cream of mushroom soup is really rich, but worth it. :-) Thanks for the comment. Hi Angie, pumpkin season is fun, isn't it? Not to mention tasty! Thanks for the comment. Hi Lea Ann, love soup season! :-) Thanks for the comment. I've already made chili, even though it's still hot out. I just can never wait! Hi Mimi, we can never restrain ourselves from making chili while it's still warm out, either. :-) Thanks for the comment. Have a great vacation! Unplugging is terrific from time to time. And soup is my favorite this time of year - all year actually. Thanks so much! Hi Tricia, unplugging is good. :-) Thanks for the comment. Hi Greg, it's a tough job, but someone has to do it! :-) Thanks for the comment. Is there anything better than a big bowl of soup in the fall? Have a wonderful vacation! Hi Kelsie, nope -- can never get enough of soup! Thanks for the comment. Enjoy your vacation! This is such a wonderful time of year, on the cusp of two seasons! 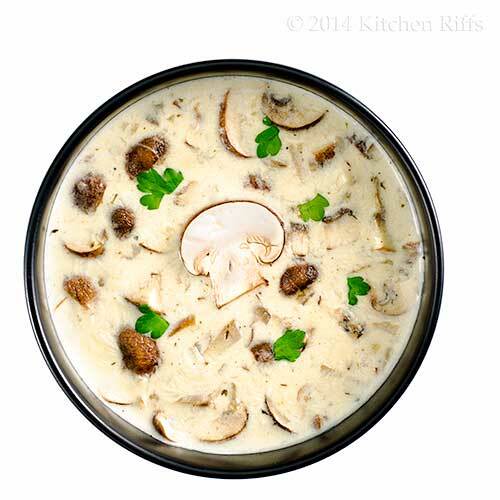 The cream of mushrooms soup looks so inviting, I'll save the recipe for November. That's when our cool weather arrives. You've given us plenty of inspiration with all these fabulous soup recipes! Enjoy your time off. Hi Deb, we love late September/early October weather. Our favorite of the year! Thanks for the comment. Hi Liz, a lot of souper soups here. :-) Thanks for the comment. oh yes indeed, this is the season for soup and chili!! I think your favorites are mine as well. I honestly don't know if I ever met a soup I didn't like. There is something about soup and chili that just warms the soul. I hope you have a great vacation! Thanks for all the soup inspiration! Hi Dahn, isn't soup SO good?! At this time of the year we have soup and/or chili several times a week. We never get tired of it! Thanks for the comment. Hi GiGi, fall is definitely my favorite season! Who doesn't get giddy over it? :-) Thanks for the comment. Thanks for all those choices. The mushroom soup looks particularly tempting. Hope you have a nice vacation. Although it's springtime downunder, we had snow recently... so these recipes are perfect! Thank you John. So ready for soup season, John! You have some terrific recipes in your roundup here...especially those chili recipes. You've got me craving some chili! Oct 11 is my bday, just FYI LOL Looking forward to your return post and I hope you all have a wonderful break! Hi Ashley, :-) Thanks for the comment. Hi Jeff, that mushroom soup is really terrific. :-) Thanks for the comment. Hi Liz, early spring weather can be pretty chilly, so these soups work for you, too. For another few weeks. :-) Thanks for the comment. Hi Marcelle, we'll be having a really good recipe for your birthday! Wish it was already the 11th so we could post it. :-) Thanks for the comment. I have a sudden craving for a big bowl of chili. It looks terrific. Hi Pam, sorry about that craving thing. :-) Thanks for the comment. Fabulous round up John as this weather is just screaming for autumn soups and chili. Enjoy your rest and looking forward to catching up in October! Hi Bobbi, isn't coup and chili season wonderful? :-) Thanks for the comment. Hi Judy, being unplugged is a good thing! Of course Mrs KR might say I'm unhinged. :-) Thanks for the comment. These all look delicious John, i might try the slow cooker chili. I can feel fall in the air. I've been clawing and scratching to hang onto summer but realize it's a losing battle...the plants are ready for a break and the cooler weather is apparent, especially in the evening. So soups are IN and I admit I'm ready. What a great roundup; thanks! Hi Gerlinde, that slow cooker chili is really easy to make. And awfully tasty. :-) Thanks for the comment. Hi Barb, we're always sorry to see summer go, but really like soups, so we're happy for soup weather. :-) Thanks for the comment. Yummy! Slow cooked homestyle chilli for me. Or, maybe the mushroom soup, never could pass up on the Shrooms. Hi Anna, Shrooms are GOOD! :-) Thanks for the comment. Great collection of soups John, enjoy your time off. Hi Cheri, we're looking forward to some time off. :-) Thanks for the comment. Since we are still having fairly sweltering weather here, I will definitely have to bookmark these great soup recipes for when the weather starts to turn cooler. I am just working on a post that disparages Cream of Somethings in a can so I had to smile when your mushroom soup popped up here (which looks amazing, btw, as do all of these recipes! Cooler weather now, please. Enjoy the hiatus! Hi Carolyn, you're having a really hot September! Let's hope October is more normal. :-) Thanks for the comment. Hi Debra, those cream of something soups are so 50s and 60s, aren't they? :-) Thanks for the comment. Autumn there spring in here, but no one stopping me have soups as delicious as this. You're definitely right, John. This is the season for soups—and I'd go for any of the ones you list. Ditto for the chilis. Hi Raymund, these soups are good any time of the year! :-) Thanks for the comment. Hi Emma, a lot of good recipes in this post! :-) Thanks for the comment. Hi Frank, we LOVE soup and chili season! Such good stuff. :-) Thanks for the comment. Hope you're having a great vacation! And, this post is perfect timing. I've been thinking soup and chili. Looking forward to simmering pots of delicious. Hi Lisa, September always is the start of soup season for us! :-) Thanks for the comment. Here in Northern Australia we are just in Spring but today is coolish and wet so these recipes really appeal. Enjoy your break! What a delicious collection of recipes! Happy vacations! Hi Marcellina, all of these are great beginning-of-spring recipes, too. :-) Thanks for the comment. Hi Katerina, a lot of good stuff here. :-) Thanks for the comment. I love you collection of soup recipes. I am a big fan of soup, I love eating it when the weather gets cooler. Hi Dawn, it's gotten hot here again, but we're still craving soup! :-) Thanks for the comment. Hi Marta, you're having a wonderful road trip! Although if I lived in Berlin I'm not sure I'd ever want to leave it. :-) Thanks for the comment. 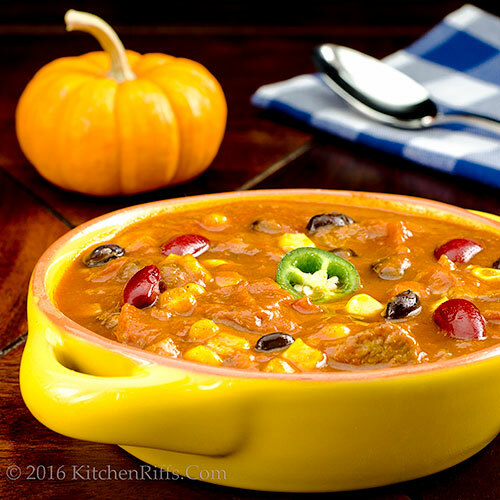 I like the colors of your Pumpkin and Pork dish- including the bright yellow casserole dish. I'll miss you John- hurry back from your vacation! Hi Fran, we won't be in TOO much of a hurry to get back. :D Thanks for the comment. It's definitely the time of year for all things soup! Hi Carolilne, it is! :-) Thanks for the comment. This is such a nice round up John, thanks for sharing. John, this is a superb collection of just what I'll be craving as we move into autumn and winter! Can't wait to try some of these. Hi Amira, don't you love soup season? We sure do! Thanks for the comment. Hi Jean, enjoy! :-) Thanks for the comment. You had me at soup and got me at chili. It's not even cold enough here for either, but I'm eating them anyway. All these recipes sound sooooo good. Love the Chili recipe round up. So many recipes to choose from. In fact I made the first Chili for the season today as it is getting little cooler here. I am in a soup mood myself and your collection gave me some pretty delicious ideas! Thanks for sharing! Hi Pamela, if the calendar says fall, our bellies say soup and chili. :-) Thanks for the comment. Hi Shibi, the first chili of the season is always so good, isn't it? Thanks for the comment. Hi Katerina, we're always in a soup mood! :-) Thanks for the comment. I think you just solved my dinner problem! Have some nice down time! See ya soon! Looks delicious. It is finally chilly enough in the evenings around here for soup season to begin. Hi Abbe, soup often solves our dinner problem. :-) Thanks fore the comment. Hi Amalia, don't you love soup season? Our favorite time of the year! Thanks for the comment. The weather here in Europe has been very cool and any one of your delicious looking creations would be perfect. Hi Karen, soup is always so warming, isn't it? Thanks for the comment.